Tri-County Regional Vocational Technical High School recently presented Cory’s Cause to the senior class. Cory Palazzi, of Taunton, is permanently disabled after suffering a brain injury caused by a heroin overdose which resulted after first becoming addicted to prescription opioids from an athletic injury. Cory now struggles to walk and has to use a wheelchair at times. He is legally blind, his speech is slow and he has trouble controlling certain muscles which makes him unable to do simple everyday tasks without help. The presentation was given to seniors as a part of the Positive Attitudes for Work Success (PAWS) program. PAWS prepares students for commitment to productive citizenship, gainful employment, personal responsibility and the setting of high standards of achievement in both vocational and academic courses. Seniors participate in a monthly seminar to address topics of concern in their transition from high school to college, career and/or military. All students are required to participate in the PAWS Program. During the presentation, seniors were fixated on Cory and listened as he talked about his experiences with drugs. His presence was very compelling and made the result of drug use and overdose very real. At the end of the presentation, many students asked Cory questions and were emotional over what they had seen and heard. Students also had the opportunity to shake his hand and thank him for his courage to share his story. Massachusetts, as is our whole country, is in an opioid epidemic. Athletes in particular, due to their risk of injury and the resulting pain, may be at risk for misusing prescription opioids. Representative Jeffrey Roy, a member of the S.A.F.E. Coalition attended the assembly. Mr. Roy currently serves on the Board of Advisors. S.A.F.E. is a coalition of community partners who have come together to provide support, education, treatment options, and coping mechanisms for those affected by substance abuse disorder. 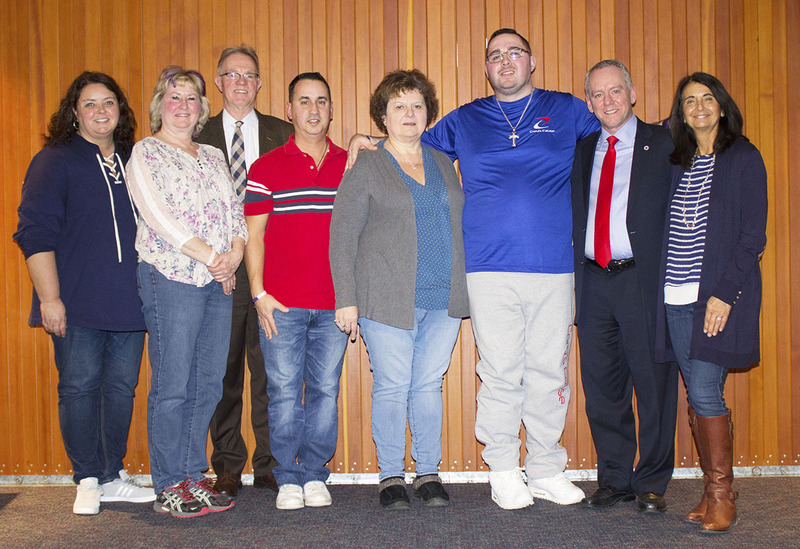 Cory and his family have taken their experience and he, his mother Lori Palazzi and stepfather Dave Gonsalves now speak at schools about the dangers of drug usage and offer a message of hope for those faced with addiction. In an effort to help those who are dealing with the challenges the family once faced, they have formed the Cory’s Cause Foundation. Their goal is to help educate people about addiction and overdose, and to remove the stigma through sharing Cory’s story with the hope that other families won’t have to endure the pain that they’ve suffered. For more information on Cory’s Cause and to learn more about his story visit www.coryscause.com.